HomeBlogSpiritualityHow Can Free Will and Predestination Coexist? Some people insist that God gave us free will to make our own decisions, that we hold our future in our hands. Others claim our future has already been set, that God charts our course, with the outcome predestined. Let’s start at the beginning. Actually, let’s start before the beginning. Before God’s creation. God is an eternal being without beginning or end. He exists outside our spacetime reality. When he created us and the space we live in, he created time, too. Consider the spacetime continuum. If he made space, he had to make time, because the two are inseparable. To him there is no past or future. I suppose this means he sees everything as a present, existent reality. God, who exists outside of time, doesn’t have the constraints we have. Though our minds are finite, and our reasoning has limits, here’s how I reconcile the two. 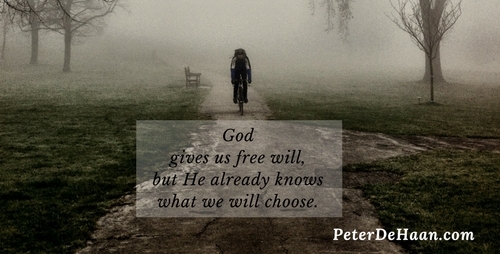 God gives us free will to choose. But he already knows what those decisions are. Because of his awareness, one not bound by time, he knows our future as if it is the present. What we see as an unknown future, he sees as a known reality. To God our future is foreknown. In essence, it’s predestined. It will happen for us in our future even though it’s in the present for him. It’s known in advance, predestined, because he sees the outcomes of the free will that he gave us. Though God allows us to choose our future, he already knows what those choices are. Nothing we do surprises him. In this way, our future is predestined, even though we have the free will to choose it. And since he already knows what will happen to us in our future reality, he works things out for our best (Romans 8:28-29).